Nalia was on antibiotics for strep throat when she came down with an odd full-body rash and random fever. A doctor diagnosed the rash as a “Penicillin Rash” in reaction to the antibiotics she was taking. She was retested for strep, and it was negative. Four days passed and she was only getting worse, with fevers spiking as high as 103 despite an around-the-clock regimen of Tylenol and Motrin, so I took her to see another pediatrician. This time the rash (which was still present) and fever were attributed to a virus. She had a horrible cough, so a chest X-ray was done to look for pneumonia (negative). The following day, her fever spiked at 105. She had lost her appetite, and would not move from lying on the sofa the entire day. Her pediatrician suggested I take her to the ER, so I rushed her in. Tests were run, and I was told that nothing was alarmingly out of place. Blood tests showed proof she was fighting infection, but they were leaning toward “virus” as they called in the pediatric specialist. 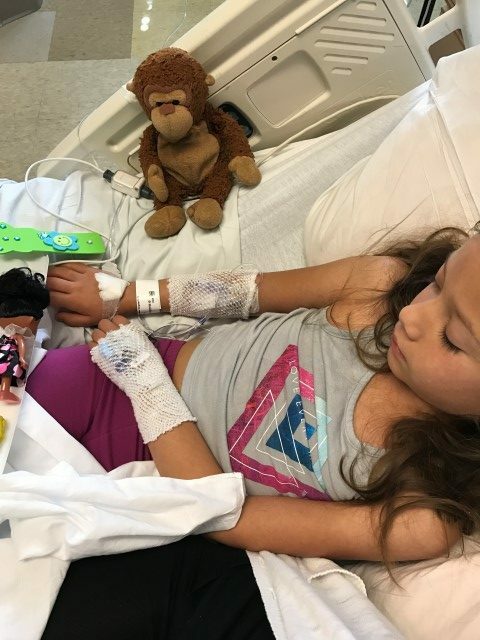 The pediatric specialist came in after reviewing her chart and said that while there was no “test” for Kawasaki Disease, she was fairly confident that Nalia had the disease as she met most of the criteria. She was admitted, and they began IVIG treatment the same night. Everything began to turn around within hours of finishing infusion. Unfortunately, she also tested positive for strep again, so I realize her case may be unique. Dad and her younger sister also tested positive for strep a day into hospitalization, but sharing our story with family and friends, and providing updates totally helped us get the support we needed. Penicillin Rash, “a virus” – neither could be treated. Inpatient, we are on day 3 and hoping to go home tomorrow. She is a unique case as she was also fighting strep throat.